Is aqua vitae always translating to whiskey? Many old sources in Ireland and later in Scotland refer to “aqua vitae”, translating form Latin to the water of life as whiskey. But was this water of life a distillate made from malted barley to be rightfully called whiskey? The Red Book of Ossory gives some hints that this may not have been the case. The Red Book was written by the Bishop of Ossory, Richard Ledred from 1317 to about 1361. It was named after its red leather binding, and contains a lengthy medical treatise on aqua vitae. This type of aqua vitae one would rather call cognac or brandy, and the reasons for its inclusion in the book appears to be for medicinal purposes only. Some historians link the entries to the outbreak of the Black Death in Kilkenny in 1348. Today, the Red Book of Ossory is accessible at the Church of Irland (RCB Library D11/2/1), it was not published for a broad readership such as the work of Hieronymus Brunschwig but remained church knowledge for centuries. Undoubtedly, Irish monks travelled and studied all over Europe in the medieval period. Monasteries were not only religious centers but places of learning and study, as well as healing centers and hospitals of that time. Uisce beatha is the name for whiskey in Irish Gaelic; the Scottish language spells it uisge-beatha. The reason for these spelling differences may originate in the fact that both languages developed as unwritten languages and mispronunciation could cause such deviations. Over the years we can find proof of several forms of the word in English included uskebeaghe (1581), usquebaugh (1610), usquebath (1621), and usquebae (1715) – which at some point was pronounced like whisk(e)y. But what is the water of life? 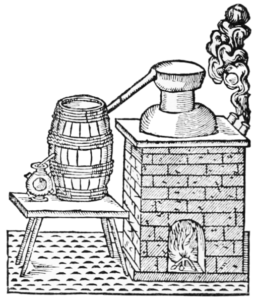 The term was used all over Europe in the Middle Ages and Renaissance for all types of distillates. Its broad origin is though in the distilling of wine, and not grain. Other European nations translated the water of life to their native languages as well: Eaux-de-Vie (French), Acquavite (Italy), Akvavit (Scandinavia), Aquavit (Germany), Okowita (Poland), оковита (okovyta) in Ukraine, акавіта (akavita) in Belarus, and яковита (yakovita) in southern Russian dialects for example. (Please note that while aquavit today is in most nations based on grain or potato mash, its origin though was a distillate from wine that was spiced. Other names are Branntwein, Weingeist or Brandy. The French Eaux-de-Vie is today refers to distillates made from fruit mashes only. In Ireland the earliest mention of uisce beatha is in the Annals of Clonmacnoise (17th century, also called Mageoghagan’s Book) describing the death of a chieftain in 1405 at a Christmas party after “taking a surfeit of aqua vitae”. 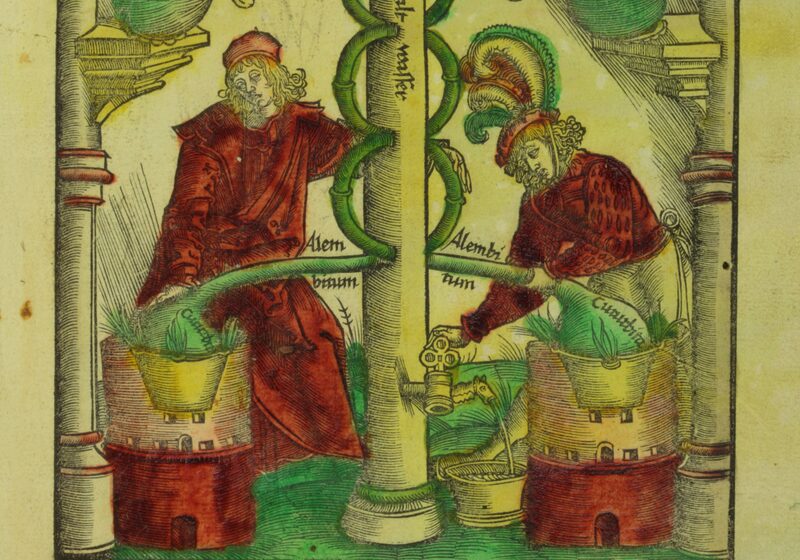 As described earlier – it is unlikely that this water of life was already distilled from grains rather than from wine regarding of the importance of the person, and as described in the Red Book of Ossory 1317 ff the distilling of wine was commonly practiced by the church. My conclusion and thesis is that the history of whisk(e)y needs be looked at very carefully. Everywhere where the authors refer to a source that is naming aqua vitae or an equivalent name it still remains unclear if it is referring to a whisk(e)y or more likely to a wine based spirit. What is Aqua Ardens? About the early history of distilling.